On November 3, 2015, Florida condominiums took another step toward electronic voting functionality when the agency that regulates residential condominiums proposed a new administrative rule to govern and clarify aspects of the nascent electronic voting (or “e-voting”) process. 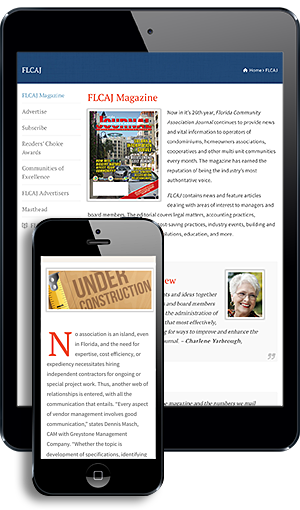 On July 1, 2015, new legislation took effect enacting Section 718.128, Florida Statutes, permitting e-voting by consenting condominium unit owners through the use of “an Internet-based online voting system.” The Florida Department of Business and Professional Regulation, Division of Florida Condominiums, Time Shares and Mobile Homes, is empowered to enact administrative rules to implement and regulate aspects of the “Florida Condominium Act”, including the new e-voting process. The Division has now proposed Administrative Code Rule 61B-23.00211 to interpret, clarify, and regulate condominium electronic voting. This proposed rule, still subject to change, raises questions even as it answers them. The first of these clarified requirements will ensure continual notice under circumstances in which e-voting is conducted on an ongoing basis, avoiding situations where new owners are unaware of their right to opt in. The latter prevents issues arising from last minute consents. • Consent to e-voting required by the e-voting statute as a precondition for electronic voting may be obtained via e-mail. • The e-voting systems must provide the owner with a receipt, including the specific vote cast, the date and time of submission, and the user identification. • The e-voting system must also produce an official record for the association identifying the specific votes cast on each ballot and the date and time of receipt of each electronically submitted ballot. The association must then maintain this record. • Votes in an election of directors shall not be accessible to the association prior to the scheduled election. Failure to comply with this subsection will void the election, requiring the association to renotice it. Although the new regulation provides clarity and protections regarding several critical aspects of e-voting, it is notable for what details regarding the e-voting process are still unclear. For example, the e-voting statute contains requirements for authenticating the identity of a voter (and preserving the secrecy of their identity, in the case of elections), which will likely require scrutiny and guidance. The technical parameters that will be required to safeguard such information and the method of confirming such safeguards are still a mystery. Many associations require the submission of a “voting certificate” to clarify voting authority for a unit owned by multiple unmarried owners or corporate owners, and the interplay of timing issues relating to such designation with the identity authentication requirements of the e-voting statute is another area for clarification. These are the type of details regulation can assist with through the input of the various stakeholders and e-voting experts. Additionally, there is still little guidance regarding the integration of e-voting into the highly regulated election process, which requires independent verification that ballots have been submitted by owners and permits pre-election public verification of outer submission envelopes for secret ballots. Contemporaneous pending proposed amendments to Rule 61B-23.0021, governing condominium election voting generally, shed some light on this issue by adding language, which addressed electronic voting. For example, the “First Notice of Election” now has to explain the e-voting procedures adopted by the board resolution to approve e-voting. Additionally, the new election rule indicates that the polls must be considered closed once either e-votes are “accessed” or outer envelopes opened, whichever is first. Both rules still leave unclear to what extent any electronic votes that are cast must be counted by the independent election committee, if at all; however, Rule 61B-23.00211 now seemingly clarifies that authentication of online owner submissions cannot occur prior to the election meeting. Additionally, neither the e-voting statute, nor the proposed administrative rules, indicate the specific timing of e-voting that is supposed to be conducted, i.e., at any time prior to the meeting after the “second notice” containing paper ballots has been disseminated, within a voting “window of opportunity” specified in the notice of meeting, for a limited period of time in advance of the meeting, etc. That said, the amendments to 61B-23.0021 do clarify that e-voting must occur prior to the election itself and cannot be cast once the polls are closed. Once these proposed rules were published, there was a 21 day period for affected persons to submit comments and request a hearing for the purpose of presenting evidence and arguments regarding their merits, or submit materials to aid in their final evaluation and adoption. As the 2015 holidays came to a close, associations and stakeholders were still awaiting a New Year’s e-voting present—an update of these rules further clarifying the issues posed by e-voting. Senior Associate Attorney, Haber Slade, P.A. Jonathan S. Goldstein is a senior associate attorney with the firm. Jonathan’s practice areas include condominium and homeowners association (HOA) law, construction litigation, and commercial litigation. Jonathan can be reached at jgoldstein@dhaberlaw.com. Haber Slade, P.A. is located on the Internet at www.dhaberlaw.com and can be reached at (305) 379-2400.